The festival of Giving was celebrated all over India from the 2nd of October to the 8th of October, 2012. Like every year, through the Joy of Giving Week people from all parts of the country come together to serve the society and to bring smiles of millions of peoples faces. Mr. Rabindranath Tagore expressed the joy of service by saying that, I slept and dreamt that life was joy. I awoke and saw that life was service. I acted and behold, service was joy. Toybank joined the Joy of Giving Week celebration and hundreds of Toybankers from different parts of Mumbai were involved in various activities at Toybank as a part of the Joy of Giving Week. The celebrations started on Oct 2, the birthday of Mahatma Gandhi, at the Footsteps4Good event conducted at Bandra-Kurla Complex where 35 Toybankers marched along the Walkathon path in support of Toybank. Toybanker, Purab Kohli, also participated in the Footsteps4Good event and spoke wonderfully about Toybank to the audience gathered. With the monies raised from the Footsteps4Good Toybank will now set up a new Toy Library in a School in rural Maharashtra. 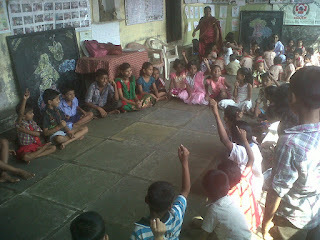 For the very first time, Toybank initiated a learning mela - Learn for a Cause as a part of the Joy of Giving Week. 6 Professional Toybank volunteers got together to help Toybank raise funds through the Joy of Giving week by sharing their knowledge! Our professional held a series of fun workshops on Photography, Zumba Fitness, Magic Tricks, Puppet Making, Art and Guitar during the 6th and the 7th of October. The venue for this initiative was sponsored by Title Waves. Toybank screened cartoon movies which were sponsored by Children's Film Society India in two of our toy libraries. 300 children enjoyed the cartoon movies at Vidya Vikas Sabha Vidyalaya and Bhimanagar School in Borivali. After the movies children were asked about the stories shown in the movies and they gave some interesting answers. The Toybank wagon stopped at many Schools, Colleges and corporate organizations to spread a word about Toybank and to board in volunteers from these institutions. 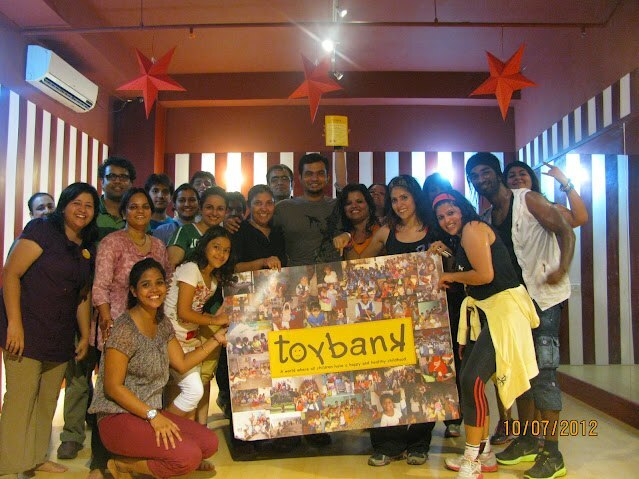 1000+ people were sensitized about the concept of Toybank. We collected over 2000 toys from all across the city. Children from Gold Crest High School, prepared for a play and a medley to be performed for children at our toy distribution event at Eternal Hope Charity Mission. Toybank also opened a new Community Game Library at CORP as a part of the Joy of Giving Week. Toybank appreciates the constant support and efforts put in by each of our supporters and volunteers to make this Joy of Giving Week a great success.